CHICAGO, IL--(Marketwired - Jan 13, 2014) - This year at the 43rd Annual Barrett-Jackson Auction in Scottsdale, AZ, attendees will have the opportunity to see some original, eye-catching cars and even enter for the chance to take one home! To celebrate the nationwide launch of its new STA-BIL® 360° Protection Ethanol Fuel Treatment and Stabilizer ("STA-BIL 360°"), STA-BIL® is partnering with Velocity TV's hit show, Car Fix, to kick off the "STA-BIL 360° Custom Car Sweepstakes." One lucky person will win a reimagined custom 1971 Chevrolet Camaro, built by Car Fix hosts, Jared Zimmerman and Lou Santiago. Winner will also win a trip for two to the 2014 SEMA Show in Las Vegas, where the car will be presented to them. "We love dreaming up new ways to rebuild cars and had a blast getting our hands dirty rebuilding the 1971 Camaro for the STA-BIL 360° sweepstakes," said Jared Zimmerman. "This muscle car is indescribably beautiful with every detail considered, and the winner is going to have one hot ride to cruise around in!" The dramatic rebuilding of the Camaro will be featured on Car Fix in a four-part series that will air on Velocity TV in February. Viewers will have the opportunity to witness the Camaro's hands-on transformation into a muscle dream car. The custom 1971 Chevrolet Camaro Muscle Car will be on display at Barrett-Jackson at the Gold Eagle Co. booth, located on Rig Row outside WestWorld pavilion near the pre-staging lanes for fans to enjoy. Plus, Car Fix host, Jared Zimmerman, will make an appearance at the booth on Saturday, January 18 from 12-3 pm to talk with fans about the car build and sign autographs from 12-12:30 pm. "We're proud to partner with Car Fix and its hosts, Jared and Lou, to create the ultimate muscle car in celebration of our new STA-BIL 360° formula and are really impressed with the result," said Marc Blackman, president and CEO of Gold Eagle Co. "Rolling out at stores nationwide this month, STA-BIL 360° delivers the first ever comprehensive corrosion protection, ensuring classic car lovers can rest easy knowing their engines will be running at peak performance for years to come." To keep engines in great shape, STA-BIL 360° is the first ethanol treatment to deliver comprehensive corrosion protection above and below the fuel line through revolutionary, new chemistry. To meet the demands of consumers seeking ultimate performance, STA-BIL scientists developed this innovative product to deliver comprehensive corrosion protection. When added to fuel, STA-BIL 360° releases a vapor inside the fuel system that coats all metal parts including the fuel tank, fuel sending unit, valves, carburetor, fuel injectors and intake manifold. Offering 360° corrosion protection, STA-BIL 360° is safe and recommended for use in all types of gasoline from ethanol-free fuel to E85 blends. The STA-BIL 360° Custom Car Sweepstakes will run from now through August 31, 2014. The winner will be announced live on a special 2 hour airing of Car Fix on Saturday, October 11, and the car will be officially presented to the winner at SEMA 2014. To enter the sweepstakes, visit http://velocity.com/customcarsweeps to complete the online entry form. To find or learn more about STA-BIL 360° and other STA-BIL products, please visit sta-bil360.com, sta-bil.com or facebook.com/STABILBrand. Car Fix airs on Velocity. For programming information, please visit Velocity.com. Established in 1971 and headquartered in Scottsdale, Ariz., Barrett-Jackson, the world's leading collector car auction and automotive lifestyle event, specializes in providing products and services to astute classic and collector car owners and automotive enthusiasts around the world. The company produces The World's Greatest Collector Car Auctions™ in Scottsdale, Ariz., Palm Beach, Fla., Reno Tahoe, Nev. and Las Vegas, Nev., where hundreds of world's most sought-after, unique and valuable automobiles cross the block in front of a global audience. Barrett-Jackson also endorses a one-of-a-kind collector car insurance offering for collector vehicles and other valued belongings. With an unprecedented expert staff, including Craig Jackson, Steve Davis and Gary Bennett who have over 130 years of combined experience in the automotive field, Barrett-Jackson offers the most diverse and desirable inventory accompanied with trustworthy and transparent customer service. More information about Barrett-Jackson, including details on expanded television coverage on the FOX family of networks which includes the National Geographic channel, can be found at www.barrett-jackson.com, or by calling (480) 421-6694. 'Like' us on Facebook or follow us on Twitter @Barrett_Jackson. 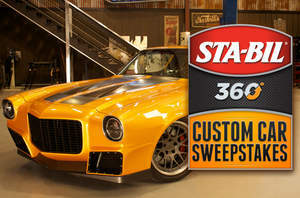 Win this custom 1971 Chevrolet Camaro, completely re-built by the hosts of Car Fix, in the STA-BIL 360 Custom Car Sweepstakes!